2013 was a tough year for science in Italy, witnessing the theft by animal rights extremists of animals from a medical research laboratory in Milan and the passing by the Italian Parliament of a law that threatens the future of medical research in Italy. But it has also been the year when scientists in Italy have started to push back in earnest against the tide of ignorance and disinformation, with Pro-Test Italia holding rallies in Milan and Rome, while thousands of Italian scientists – led by the country’s largest medical research charities – wrote to the government to ask them to stop the damaging legislation, and more than 10,000 scientists signed a petition to the EU commission asking them to take action against the dangerous Italian legislation. As 2013 came to a close this ongoing crisis took an unexpected turn, as news emerged that animal rights extremists had harassed and threatened a seriously ill student named Caterina Simonsen who had spoken out in favour of animal research. Caterina shared the photo on the Facebook pages of Pro-Test Italia and “A Favore della Sperimentazione Animale”. She was motivated to do this because animal rights activists, in particular the Partito Animalista Europeo (PAE – on of Italy’s largest animal rights groups), have been attacking the Fondazione Telethon, a leading Italian research charity that focuses on developing new therapies for genetic disorders. Over the next few days she received hundreds of angry responses and over 30 death threats from animal rights extremists, which have been turned over to authorities. In response to the harsh criticism, Caterina made a video (http://youtu.be/RbTfRMoj19w and http://www.youtube.com/watch?v=NbwBuHHC-PA) that was played repeatedly on Italian television networks. ”I have received messages saying that the lives of 10 rats are more important than mine. I don’t know what planet these people live on and who raised them,” she said, breaking into tears. ”I am alive thanks to doctors, to medicines and to animals who had to be sacrificed.” She said she wanted to become a veterinarian “to help save animals”. In her videos and a subsequent interview with an Italian newspaper Caterina noted the serious deficiencies in science education in the Italian school system, resulting in a very poor standard of public debate on scientific issues and bad decisions by Italian politicians. She highlighted the Stamina case, where in 2013 the Italian parliament backed funding for a clinical trial of an extremely dubious stem cell therapy being promoted by a psychologist named Davide Vannoni (later blocked by the Italian Health Minister on the advice of a committee of stem cell experts). Caterina is a vegetarian and a veterinary student who loves animals (it’s even possible to see a dog sleeping on her bed while she records the video), but this wasn’t enough for some animal rights activists who commented on her video with various kinds of insults and even death threats. Their action sparked a quick and unanimous response from many other Italians: No one can use those kinds of words against Caterina. Soon Caterina’s Facebook page and Youtube videos were flooded with messages of support, and a dedicated twitter hashtag was created, #iostoconcaterina (#iamwithcaterina). 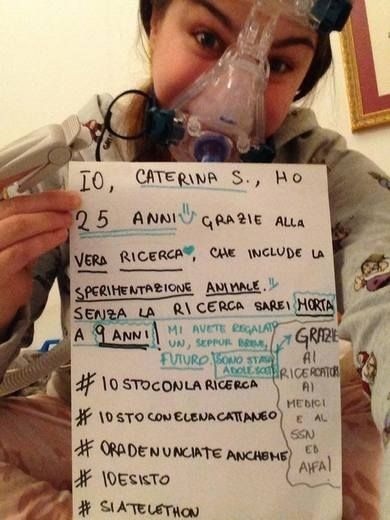 Soon many patients and scientists followed Caterina’s example, posting a picture of themselves expressing the necessity for animal research on the Facebook page A Favore della Sperimentazione Animale, where Caterina had posted her picture, while tens of thousands of Italians showed their support for Caterina by tweeting #iostoconcaterina. This way the topic spread through the Internet and started to attract journalists: by 27 December Caterina photos and videos appeared on the TV screen and during the news and on the newspapers (e.g. here, here, here and here) with the story subsequently being covered by media in many other countries, including the UK, Germany, Australia and USA. Many high-profile personalities expressed their support for the young girl, including Matteo Renzi, leader of Italy’s Democratic Party and a likely future prime minister, and the film director Gabriele Muccino. A few days later in an opinion poll of over 2,000 people on the website of the leading newspaper Corriere Della Sera, 80% answered “yes” to the question “Do you support the testing on animals for therapeutic purposes?” It seems that somehow the public support to the cause of medicine and scientific research was already there, and that Caterina’s courage has brought it to the surface. The reaction of the Italian animal rights groups was mixed, some eventually condemned the harassment and threats against Caterina, but others reacted more negatively. The PAE – which is a very strong supporter of Davide Vannoni’s dubious stem cell therapy – retreated into conspiracy theory, even suggesting that Caterina does not actually exist! Today, Caterina is in hospital because of her illness and even if she wants to thanks all the people that support her, she reminds them she’s not looking for fame so asks the journalists and the other people to respect her privacy. As 2014 begins we hope that Caterina’s decision to speak out will spur more supporters of science and medical progress in Italy to make their own voices heard, her bravery has created an opportunity for the Italian scientific community to decisively turn the tide against ignorance and extremism. 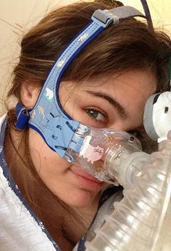 Posted on January 2, 2014 January 2, 2014 by EditorPosted in Animal Rights News, Campus Activism, NewsTagged #Iostoconcaterina, animal testing italy, Caterina Simonsen, Noi stiamo con Caterina!, Pro-Test Italia. Oh really ? Try Wayne State University (Detroit, Michigan) — cardio experiments on dogs. Donal O’Leary isn’t even an MD or a DVM. You want more ? …you realise MD’s are medical doctors and are not generally researchers. Professor Donal O’Leary is a doctor through having a PhD like most researchers (nearly every academic researcher in any field either has, or is working towards, a PhD). Yeah, there’s a lot of needlessly cruel experiments. But even without those, there would be people fighting against animal testing. No one side in a dispute like this ever has the “moral high ground”, and we should all stop acting like that’s not true. Let’s all agree that “torture testing” = Bad; and halting all scientific research intended to reduce human suffering also = Bad. There’s fighting for what’s right, and then there’s attacking a 25-year-old girl with 4 genetic diseases for wanting to resume breathing. If incompetent and unethical animal testing labs didn’t do all the useless torture experiments they do, there wouldn’t be a backlash in the first place. Now, not only are the animals victims, but so too is this girl. Nice going Big Pharma ! What?! So to use a comparison – because there are people who shout that the moon landing is a fake that must be true also? Yes Tom, the moon. That’s about as relevant to medical testing as is your paycheck. The more grotesque the experiment, the more likely it is that the NIH will fund it, because they’re easily duped. Look for the analogy behind the comment. And why would a more grotesque experiment more likely get NIH funding?! You do realise that most research is in the lower severity bands in the US – which basically destroys your point here.